She dooie losserey yn-ee eh Brassica oleracea. Ta ny troaragyn echey goaill stiagh caayl vane, callish Rangagh, caaylag, caayl chraplit, caayl jiarg as gailan. T'eh dooghyssagh da'n Oarpey 'lystagh heear as yiass. Brassica oleracea possan Acephala – caayl jiarg as duillagyn glassey arree. Shoh y possan smoo casley rish Brassica oleracea feie. 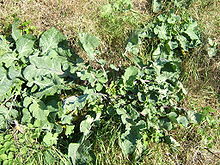 Ta tooilley coadanyn mychione Brassica oleracea ry-gheddyn ayns Wikimedia Commons.